Like many municipalities, the City of Swift Current is looking at methods to preserve the airspace at their landfill. One option of prolonging the capacity of a landfill is by reducing the volume of disposed cardboard and waste wood. For a number of years, the City has attempted to divert waste from the landfill through a cardboard recycling program. Though residential participation in cardboard recycling has been excellent, there are still a number of industrial, commercial and institutional sources of cardboard that end up in the landfill. Added to this complication, the cardboard that is recycled is sold to a collection company and shipped to other locations in Canada and the United States, which has a significant carbon footprint. But where some people see a problem, the City of Swift Current saw an opportunity. They contacted SRC to find possible alternative uses for recycled cardboard. In the first phase of the project, SRC investigated gasification, incineration, landfilling and composting, and compared them with the current practice of shipping out for recycling or landfilling. The current method only captures the residential stream. We found that the City likely has an opportunity to reduce its cardboard disposal costs, while also making a positive difference for the environment. There are varying social, technological and economic risks with all of the alternatives for managing cardboard waste. Selecting a solution required addressing these risks, as well as considering the cost. Gasification was projected to be one of the lowest-cost options overall and was selected by the City of Swift Current to be pursued further. HOW DOES GASIFICATION DEAL WITH THE CARDBOARD PROBLEM? Gasification is different than simply burning combustible material. During incineration (or “burning”), the carbon and hydrogen portions of the fuel are completely converted to carbon dioxide and water. During gasification, only some of the fuel is burned completely. A limited amount of oxygen is introduced into the gasifier to provide the heat needed for the reaction; the remaining fuel is converted to carbon monoxide, hydrogen and some methane. This mixture of output gases is called synthesis gas or “syngas” and can be further burned for energy or heat. Small modular gasification units are typically paired with one or more internal combustion engines, which are equipped with heat recovery. In this way, combustible waste material can be converted to useful power and heat. A simplified version of the process is shown below. But, gasification has some challenges. The syngas it generates has low-energy content, meaning that specially tuned engines are required. It can also contain a lot of tars, which need to be removed before the gas can be burned in the engine. Some of the feed material (in this case, cardboard and wood) will be converted to biochar, which is an ash-like product high in carbon. Fortunately, biochar has been used as a soil conditioner and can be used as daily cover on landfills1 or in the City's yard waste composting process. Gasifiers also tend to be high-capital-cost items, meaning the project must be substantial enough to justify purchasing one. A pilot demonstration can help to reduce the technical and financial risks related to purchasing and operating a gasifier. 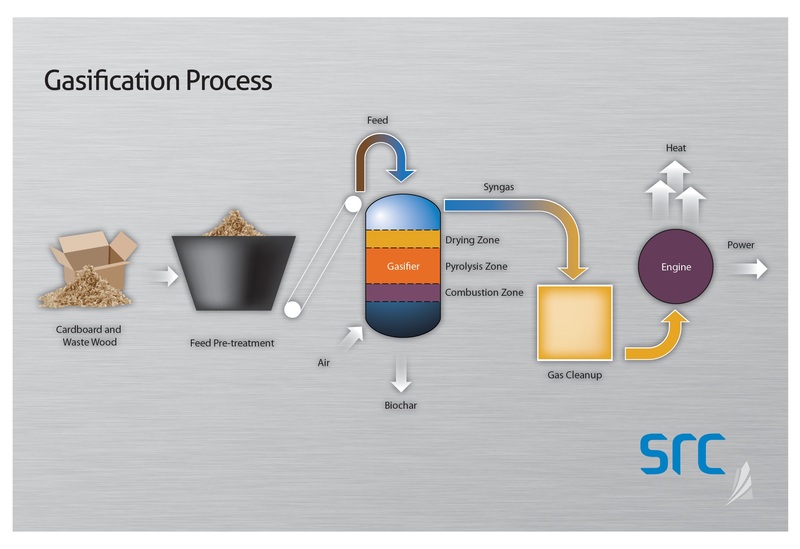 For Phase 2 of the project, SRC investigated the steps required to implement a gasification pilot demonstration. The goal of this pilot plan is to help the City of Swift Current decide if gasification is a feasible option for its mixed cardboard waste. Data gathered by the City was used to estimate the amount of cardboard and waste wood available for gasification. Using that information, SRC explored gasifier technology options, including feedstock requirements, outputs and costs (where available). The technologies were ranked and the top three technologies were further investigated. Gasification to convert cardboard and waste wood to combined heat and power could be a viable option for a municipality such as the City of Swift Current as the existing tipping fees collected at the landfill to cover cardboard and wood burial or diversion costs, recycling hauling costs and a portion of the heat and power bill could be transferred to gasification capital and operating costs, as well as a heat and power grid credit. The project may have the potential to earn revenue or funding for the municipality as it will reduce carbon dioxide emissions. Upon review of the risk factors, we’ve recommended the City implement a phased pilot demonstration. This program would be designed to collect and store cardboard (from the landfill) over a period of time, and request tonnage from the cardboard hauler for their rural customer and industrial, commercial and institutional collection in order to accurately calculate feedstock volumes and costs. Samples of the cardboard bales and screened wood waste feedstock can be sent to the selected gasifier manufacturer to test their suitability and obtain performance guarantees. The performance information and bio-char spent volume from the gasifier manufacturer can help provide a more real-world measure of the economic feasibility. If this still shows potential for financial and environmental return, the City would then take the step of implementing gasification at full scale. The City of Swift Current is leading the way in finding alternative uses for its cardboard and if the project is successful, other municipalities may follow suit. Interested in learning more about gasification? Check out the gasifier we built that powered a recording studio.